Fashion and football, two totally opposite subjects but two totally fun ones! 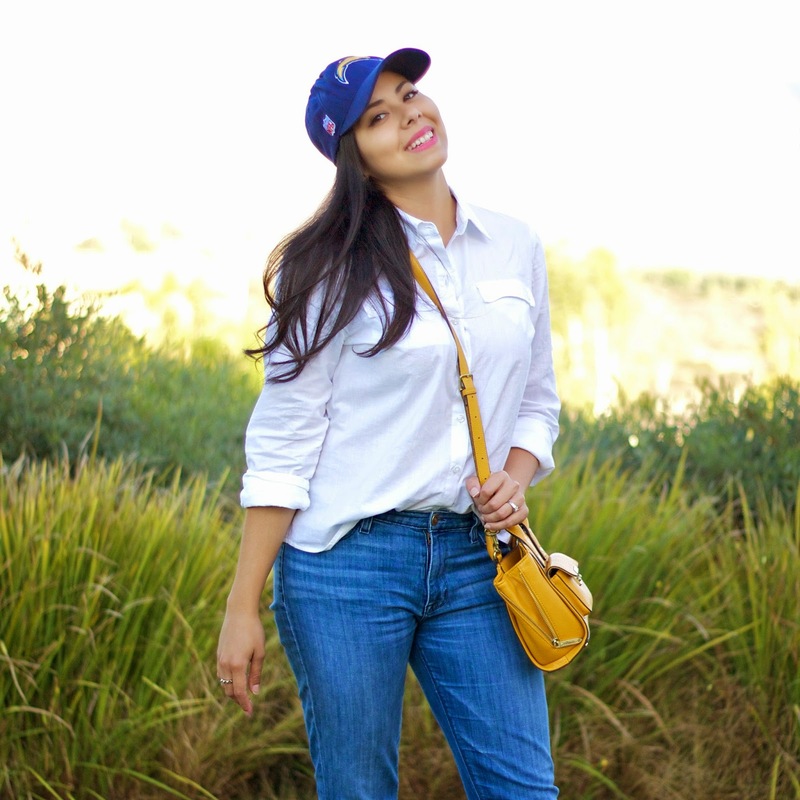 With the start of the football season (and the disappearance of my fiance and men all across the nation), today I have teamed up with 3 fabulous style bloggers to show you our team spirit using what we know best- fashion! I love that none of us wore jerseys, but kept with the color theme and gave our outfits a sporty vibe. I dressed in my Charger-esque colors and gear on the day of our first game which sadly didn't go as I would have wished, but that's football for you, you never know what you're going to get! Check out these stylish ladies for more details on their looks: Melissa from Sweet Style By Melissa representing the NY Giants, Daisy from Daisy's Fashion Garden representing the Oakland Raiders, and Jea from DaintyJea representing the Patriots. I am so in to slip ons this time of the year! This is such a fun idea for a collaboration. I like how each of you did a non-literal interpretation of team spirit. I have been on the fence about leopard slip ons (love them on others, not sure I'd wear them myself), but they are such a fun touch for this outfit. So glad to have found another SD blogger through your IG account! nice outfit, I'm a Panthers fan, though I'm more into NCAA (South Carolina Gamecocks) than NFL. Leopard slip-ons are the best! By the way, you are looking good! So cute, love this look!